It took a long time getting there. 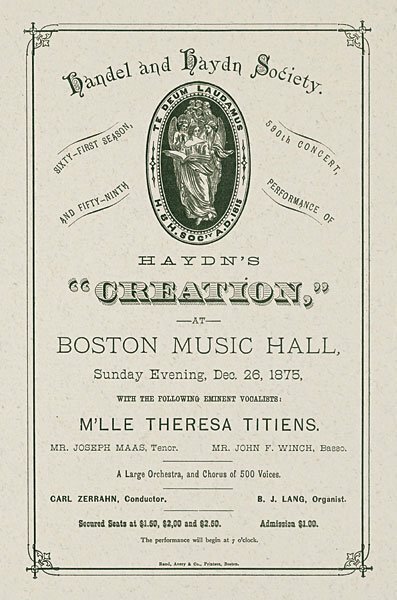 In this, its bicentennial season, the Handel & Haydn Society gave its 133rd performance of Haydn’s The Creation on May 1st at Symphony Hall (you can catch the 134th on Sunday afternoon) since it performed excerpts from it on its first program on Christmas, 1815, but this was the first time (a) it has been commercially recorded and (b) it was conducted by the Society’s current Artistic Director, Harry Christophers. It’s also the first time H&H have performed it since 2001, according to their performance database. Some things are worth waiting for, but performances as good as this need to be repeated with greater frequency. The May 1 hearing came just a day after the 217th anniversary of its premiere, at a huge “private” concert for the invited glitterati of Vienna (the first public performance didn’t happen until a year and half later). Considered by many to be Haydn’t greatest work, this oratorio contains a distillation (if you can call a 105-minute piece a distillation) of everything he had learned about both symphonic and vocal writing and everything everybody loved (and, one hopes, still loves) about his simultaneously subtle and crowd-pleasing manner of expression. Written in 1796-8 after his last symphony and after the first two of his great symphonic masses (the St. Bernard or Heiligenmesse and the Mass in Time of War), Haydn imbued The Creation not only with the grandeur of the Handel oratorios he had heard in London, but an architectural solidity that had not been applied to oratorio or similarly sprawling choral works since Bach. The libretto for The Creation has long been a source of drollery among literary historians, to say nothing of the eyeball-rolling it induces during the duet of Adam and Eve. The text was adapted simultaneously in German and English by Haydn’s friend, the diplomat and sometime composer Baron van Swieten (working closely with Haydn) from an anonymous text supplied to Haydn by Salomon in London. It combined snippets from Genesis and some of the Psalms with bits from Milton’s Paradise Lost, and the skill with which Haydn integrates the sturdy and simple Biblical prose with the arabesques of Milton’s poetry is one of the many remarkable things about the composition. What has caused titters over the years about the libretto was the infelicity of the re-translation of the German back to English, with many instances of awkward syntax and infelicitous syllable stress in setting words to music. For this reason, many productions in recent years in English-speaking countries have opted for the German text. Nevertheless, since it was Haydn’s wish that it be sung in English in English-speaking countries, H&H used our language, with some occasional amendments to tone down some of the howlers (though with one striking change at the end, about which more below). The Creation being, one hopes, a fairly familiar work, there’s not much to be gained by providing a detailed description of it here; a very nice structural analysis appears on Wikipedia. Suffice it to say here that, like Handel’s Messiah, it is divided in three parts, the first dealing with the creation of the astronomical and geographical world, the second with the fauna (culminating, of course, with us humans), and the third with prelapsarian Eden. This parallel of large structure between these two pillars of the oratorio repertoire, incidentally, provided the impetus for a stroke of imagination by the early H&H, for in 1817 they performed the two of them “side by side” as it were, in three successive programs. Part 1 begins with one of Haydn’s most famous and original conceptions, the representation of Chaos in an orchestral overture, where to suggest the unstructured pre-universe Haydn withholds closing cadences from his phrases, prefiguring Wagner by a century and a half. Into this murk the archangel Raphael (bass-baritone Matthew Brook) insinuates the recitative setting of Genesis 1:1 that touches off the chorus’s C major blast on “and there was light,” that gets everything rolling. In his note in the program book, Christophers made his apologia for using the English version of the libretto and added that “I have assembled a cast whose knowledge of the language is exemplary…” Applying, therefore, these elevated standards, and making no concessions to the guttural gibberish produced in this country, the three principal soloists, Brook, who doubled Adam with Raphael, soprano Sarah Tynan, singing Gabriel and Eve, and tenor Jeremy Ovenden as Uriel, are all British (chorus member Margaret Lias, mezzo, joined them for the final number). In the event, the implied smackdown was unwarranted: of the three, Brook was sensationally good, with every word intelligible and every note smack on center; the other two, while first-rate singers, are not likely candidates for the title of Lord (or Lady) High Elocutioner. All three exhibited wonderful stage presence and dramatic personality, and projected well into the vastness of Symphony Hall, but Tynan’s and Ovenden’s vibrati kept one’s nose in the libretto, even those of us who fancy ourselves native anglophones. Thus, no better or worse than American singers of equivalent stature (of whom there are many). Lest anyone still entertain lingering doubts about the effectiveness of an early-instrument band to put forth the expression, power and sheer volume that a huge work like The Creation demands (Haydn scaled up his orchestra for this, with more winds and brass than in any of his symphonies, including three flavors of trombone, and a contrabassoon that, in the hands of Damian Primis, towered over the orchestra like a telephone pole), just forget all about it and go hear the performance Sunday. Christophers’s snappy tempi, tight ensemble, shapely phrasing and brilliant dynamic control were a joy, and the performance as a whole was better than any we’ve heard over the last 40 years or so in Boston (admittedly, we missed the 2001 reading under Grant Llewellyn). The chorus, which was, after all, the society’s raison d’être in 1815, was precise, ebullient, refulgent. There were a few awkward moments of orchestral ensemble and a flub here and there that make us hope H&H will record the Sunday performance as well, to have some “spares” from which to construct their recording, which is scheduled for release in October. Our notebook contains numerous indications of particularly lovely moments in the performance, of which a few highlights are these: Tynan’s arias in Part 1, “With verdure clad,” and in Part 2, “On mighty pens” (whether or not a mighty pun was intended, it means “wings”), were splendid, and in the latter the woodwinds contributed their all, especially the amazingly silken clarinets and bassoons, and the radiant flute birdcalls. The trio and chorus that ends Scene 1 of Part 2 (which is where Christophers chose to break for intermission), whose suggestion of Mozart’s “Là ci darem la mano” causes one to sit bolt upright, and whose later hat-tip to Handel in the chorus’s repeated “forevers” reminds the listener of Haydn’s self-conscious assumption of the older composer’s mantle, were profoundly moving, as were the similarly scored and similarly contrapuntally constructed endings to Part 2 and Part 3. The latter number is just a chorus following Uriel’s recitative summing up the story-so-far of Adam and Eve, and here came the somewhat eyebrow-raising modification to the libretto, at least the printed one. This is Haydn’s one hint (presumably by way of Milton) of the unpleasantness to come: “O happy pair, and always happy yet, if not misled by false conceit,” it reads. What Ovenden sang, however, was something more like “and would be happy yet…” with a subjunctive that pinches much tighter than Haydn’s and van Swieten’s orthodox yet Enlightenment-tinged viewpoint would have done (so, yes, sometimes Ovenden’s enunciation was clear enough to know that what he was singing was different from the printed text, especially if reading at the same time). What the provenance of the change was, we have no idea, but an editorial hand was clearly at work, and in this case it wasn’t just for felicity of expression. Still, we have no hesitation to recommend anyone’s hearing this performance. The hall was not absolutely full on Friday, so there may be ample opportunity for late deciders on Sunday. Overall it was a good concert but not the best. While it is always interesting to listen to the works of the great, this particular interpretation was laudably flawed. The orchestra started out of balance, and the whole first part they were playing as at a rehearsal, gradually improving and playing the second part better. Soloists were adequate while the soprano was often disappointing. She lacked vocal control and sounded screaming often, and her voice was not particularly pleasant. The composition reminds of Israel in Egypt, and one could clearly hear that Haydn’s style was eclectic. Again, it was an interesting work but the orchestra lacked sparkle and energy. Horns are always out of tune with this orchestra, which is awful but sadly, expected. Lebedkina’s comment is so far at odds with the review and what I heard with my own ears, that one has to wonder whether this person was at the same concert. I am a reasonably seasoned concert-goer, and had the good fortune to be able to attend both performances. Creation is a favorite. The forces were all on top form – I don’t think H and H’s chorus have ever sounded more vibrant – the pride of Boston. Likewise the orchestra – sparkling and beautifully elegant. All of the considerable forces at one with Christophers’, by turns passionate, loving and inspirational leadership. I agree with the reviewer – this was the best performance I have heard in Boston. Or, for me at least, anywhere else as well.